This review first appeared in the October 11, 1996 issue of the North County Times. How can a jazz band get mainstream media attention in our pop-oriented market? Why not hook up with a leading popular singer and run through a set of standards featuring bright arrangements, lots of hot solos and an easy dance groove? 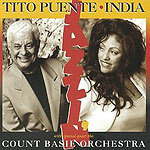 And so Latin jazz legend Tito Puente has hooked up with Latin pop diva India, adding the Count Basie Orchestra to the mix as well. Unlike, say, pop star Chaka Khan's early 1980s jazz outing with Chick Corea and his Return to Forever colleagues, this collaboration doesn't work. India has no swing; her vocals come out flat and miss the beat half the time. She sounds tentative and uncomfortable fronting the Puente and Basie bands  both of which, by the way, are simply on here and absolutely crackle. Basie alumnis Grover Mitchell is now leading his late boss' outfit, and has kept up the Count's standards for quality and hard-charging swing. And Mitchell is joined by several other Basie veterans, men who played with the Count, like reedman Kenny Hing and trombonists Bill Hughes and Melvin Wanzo. It's still a Basie band, all right. Puente's Latin big band is equally tight, and features stars like saxophonists Mario Rivera and Bobby Porcelli, with a guest appearance by Dave Valentin on flute. As good as the bands are, though, India's vocals are that bad. Maybe they should issue a remixed version of this album, with all instrumentals.